This Nov. 12, 2018, photo shows Rep.-elect Alexandria Ocasio-Cortez, D-N.Y., in Washington. 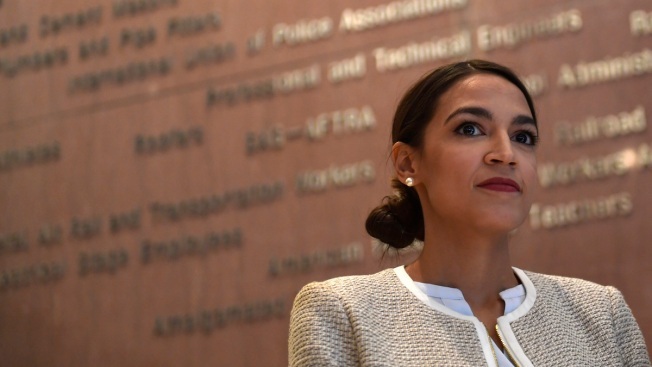 A Washington Examiner reporter who posted a photo of newly elected Democratic Rep. Alexandria Ocasio-Cortez that he claimed was proof she was not "struggling" for money deleted the post after backlash from thousands of Twitter users on Thursday, NBC News reported. Reporter Eddie Scarry's tweet followed Ocasio-Cortez telling The New York Times last week she would have difficulty paying for an apartment in Washington, D.C., until she starts collecting her congressional salary next year. Twitter users proceeded to blast Scarry for the tweet, with many mocking Scarry for focusing on her clothes. One user called the post a "creep shot" and an "insult." By 6 p.m. ET, the tweet had more than 5,000 replies compared to roughly 50 retweets and 200 likes, creating what is known online as a "ratio" of more replies than retweets and likes. Ocasio-Cortez responded to the tweet hours after it was posted, saying her opponents would criticize her no matter what she chose to wear. Scarry later said he was merely trying to say the Congresswoman "looked well put together" and his original meaning was misconstrued. If I walked into Congress wearing a sack, they would laugh & take a picture of my backside. If I walk in with my best sale-rack clothes, they laugh & take a picture of my backside. Dark hates light - that’s why you tune it out. Oh, does @eScarry think he can delete his misogyny without an apology?